Thankfully, my annoying sickness only lasted about 24 hours, so by Saturday I was back in action and my parents came down for a re-do last hurrah. There was no baseball game, but we made our own fun. We enjoyed sushi takeout for dinner on Saturday (before they return to the land of no sushi) and on Sunday morning we decided to hit up the 32nd Avenue farmers' market. We've been super excited that a farmers' market opened in our 'hood this year, but hadn't yet had a chance to really check it out. 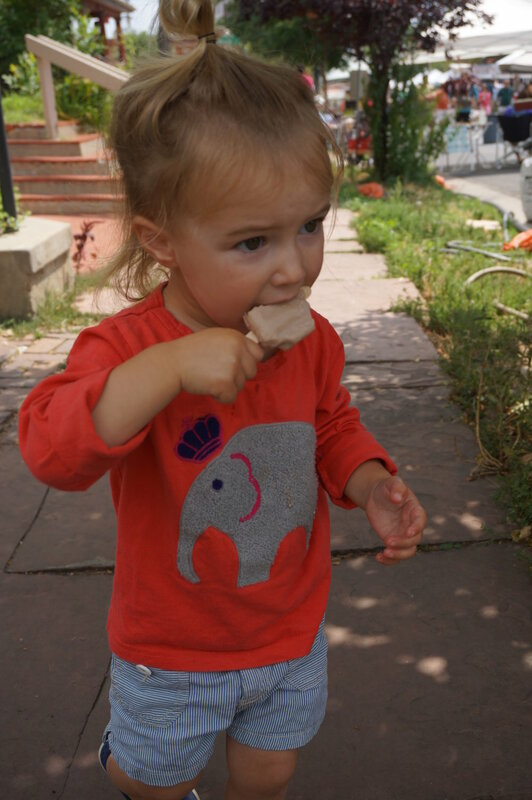 I went down there with Willa and the dog a few weeks ago, but despite their omnipresence at every farmers' market in the nation, navigating a market with a dog and a toddler is NOT easy. Also, when I was there I'd just had a big breakfast, so I didn't need anything to eat. And I didn't have any cash, which doesn't really fly at a farmers' market. Overall it was an awesome place to spend a couple hours; lots going on but at the same time not overwhelmingly crowded. And we had a lovely time with my parents. My only complaint: they need to get recycle bins! It hurt my heart to see so much paper and plastic being thrown away.